The first burials at this site, now unmarked, were for two ailing soldiers who died here following the Battle of Salado Creek near San Antonio in 1842. The oldest marked grave is that of Lee F. T. Cottle (1788-1845). Located on property once held by the Routh Family, this burial ground served both the communities of Black Jack Springs and Pin Oak and has been known by both names. An association, over 100 years old, cares for these grounds that chronicle settlers of the Republic of Texas era; slaves; veterans of the War of 1812, the Texas Revolution and the Civil War; and many area pioneers and their descendants. 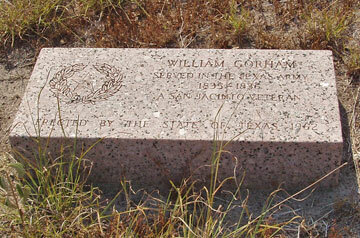 To visit the Pin Oak Cemetery from La Grange, take Hwy 71 west to County Road 609. Turn left (south) and go about 12 miles to Pin Oak Road. Left on Pin Oak Road for 1.3 miles. Pin Oak Road dead ends at the Pin Oak Cemetery. This cemetery is very well maintained. There is now a fence around the cemetery. Several family plots have their own enclosures. 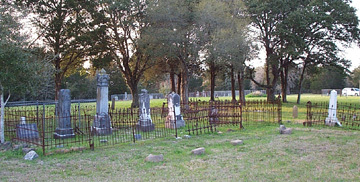 Some of the dates were taken from the booklet Pin Oak Cemetery, Fayette County, Texas, c. 1995 by Norman C. Krischke of Schulenburg. Jimmy Speed is president of the Pin Oak Cemetery Association. Clean-up dates are the third Saturday of April and third Saturday of October with rain dates the following fourth Saturday. The next workday/meeting at Pin Oak Cemetery will be Saturday, April 17, 2010, beginning 9 a.m. The rain date is Saturday, April 24. The business meeting and potluck lunch will follow the morning clean-up. This cemetery was visited on May 2, 1999 by Lana (Sawey) LeCroy, Carol (Langston) Buckland, and Gwen (Brewer) McDaniel. Transcribed May 5, 1999 by Gwen (Brewer) McDaniel. Son of Robert & M.E. Son of J.T. & S.E. Son of T.O. & Lucinda Kenner Berry. CSA Vet? wife of Clanton, A. D.
Wife of Wm. V. Criswell. m. 12 Oct 1844. Dau. of Andrew & Eliza Faires McMicken, Jr.
Dau of Mrs Bea Hall. Age 6 mo. Child of W.P. & E.E. Dau of Allen F. & Sarah J. Son of Wiley & Nancy E.
Dau of T.T. & S.E. Dau of T.T & S.E. Son of M. & J.
Dau of T.F. & E.
Son of Tom. Husb. of Maggie I. 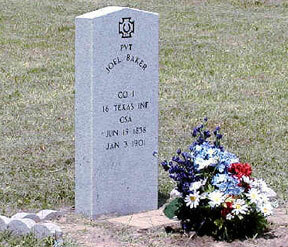 *A new CSA marker was placed on Joel Baker's grave in 2005, but the original marker also remains. See photos from the dedication of the marker and biographical information on Joel and Aurelia Baker. Photo and information provided by Rita Pressley Baker.